President Maithripala Sirisena and the Prime Minister Ranil Wickremesinghe, sacked by the president, were solely responsible for plunging the country into constitutional crisis threatening democracy in the midst of political and economic instability. When the two – Sirisena and Ranil – promised the county, during the 8 January 2015 presidential elections, that they would restore law and order and bring to justice all who plundered the country, committed crimes and virtually destroyed democracy, people trusted them. Sinhalese, Tamils and Muslims voted them to power with high hope of returning to peace and harmony. However the two miserably failed to fulfil their promises and have taken the country for a ride. 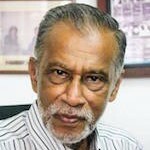 There are numerous issues of Tamils awaiting solution. Muslims who voted for Maithri-Ranil team in the hope of peace and harmony had to face violence from Sinhala racist elements with police and STF accused of involvement. Thus the minorities in general who pinned their hope on President Sirisena and Mr. Ranil Wickremesinghe feel betrayed and devastated today. Muslims have not forgotten that Mahinda Rajapaksa has the stigma of Beruwala, Dharga Town and Aluthgama attacks on Muslims while under President’s rule they were attacked in Gintota, Ampara, Digana and Akurana . They are all- Maithri, Mahinda and Ranil-hell bent on protecting their Sinhala vote banks to ensure they remain in power. While burning issues remained unattended both President Sirisena and Prime Minister Ranil Wickremesinghe began travelling abroad. Prime Minister Ranil Wickremesinghe alone reported to have made 30 trips at a colossal cost. Country’s situation is such that even attending the United Nations Annual General Assembly meetings with an entourage of sycophants was waste of public money as the UN General Assembly has become a talking shop and US-European-Israeli war mongers tool. On the other hand repeated reports of widespread corruption within the so called Yahapalanaya government eroded the confidence of the people who felt betrayed. This sickening political environment climaxed in the no confidence motion against Prime Minister Ranil Wickremesinghe over bond issue. People were so fed up that they expected Mr. Wickremesingjhe to resign from politics. However power and perks remain too attractive than moral values besides his US-European-Israeli backers wanted him in power art any cost to facilitate their agenda here. In the midst the differences between President Sirisena and Prime Minister Wickremesinghe came into open and the loggerhead prevented the country from moving ahead. While frustration of the people continue to deepen, the government opened its door for all western war mongers turning the island into US, European , Israeli war mongers’ and Indian playground. Since the collapse of former Soviet Union in 1979, under the false pretext of fighting war on terrorism, these countries have bombed and destroyed Muslim countries such Afghanistan, Bosnia, Kosovo, Chechnya, Somalia, Iraq, Libya, Syria and now Yemen. They have killed more than ten million people and driven more than 50 million innocent people to refugee camps while looting their wealth. They have a common global agenda against Muslims. Under such circumstance the presence of these forces in the island is recipe for disaster as they would certainly use racist mercenaries here against Muslims and create communal tension. Meanwhile forces hostile to Muslims from India also entered the island and even opened branch office. For example it is common knowledge that the Bharatiya Janata Party government of Prime Minister Narendra Modi who was accused of committing genocide of Gujarati Muslims in February 2002 and killed more than 2000 Muslims, is one of the deceptive fronts of Hindu fascists Rastriya Swayam Sevak Sangh-RSS. Prime Minister Modi has given open license to persecute, lynch and kill Muslims under the guise of protecting cows. There were reports of VHP mercenaries opening office in Vavuniya while some Tamil mercenaries went on demonstration in Batticaloa carrying Israeli flags shouting pro-Israeli slogans antagonizing and provoking Muslims. These forces are reported to be cultivating politicians, media, intellectuals and others brain washing them against Muslims. At a news briefing attended by university lecturers in Colombo on Wednesday 31 October 2018, Senior lecturer of law Raja Gunaratne said there is an international conspiracy to bring back Prime Minister Ranil Wickremesinghe to implement their agendas. He added that Mr. Wickremesinghe worked according to whims and fancies of their international agendas and pushed Sri Lanka into disastrous situation. It was under such chaotic political environment President Sirisena shocked the nation when he appointed former President Mahinda Rajapaksa, accused of crime, corruption and misrule, as Prime Minister on Friday 26 October 2018 while the existing Prime Minister Ranil Wickremesinghe remains in office. First thing that happened, even before ministers were sworn in, was the release on bail on Monday 29 October, of Mahson Balakaya leader Amith Weerasinghe and nine others who were in custody accused of involvement in the violence against Muslims in Digana . Amith was given a rousing welcome by his supporters who carried him on their shoulders. Now the question is what is the message the release of Amith Weerasinghe and nine others send especially to the beleaguered Muslim community? There were speculations that the island’s current political crisis was “made in India” following the recent visit to Sri Lanka of Rajya Sabha member Subramaniam Swamy who met Mahinda Rajapaksa who together with his son Namal Rajapaksa later met Indian Prime Minister Narendra Modi in New Delhi. The irony is that people gave a mandate to President Sirisena to bring to justice people who were accused of crime, corruption. However violating this mandate he had handed over power to this very same people whom he pledged the nation to bring to justice. Sri Lanka, paradise with best of nature’s blessings, was an almost developed country during its independence on February 1948. We had all required ingredients such as educated people with integrity, political stability, sound economy, foreign exchange reserve and communal harmony to turn this island into a developed one and ensure prosperous life for all. However there was one drawback and that was the racist politics and corruption which turned the country into one of the most mismanaged in the entire developing world. Unfortunately it was the people who suffer. The question is where do go from here? Isn’t there a need for a third force which values moral and religious principles from the majority community and free the country from UNP-SLFP misrule? Due to their failure to fulfil their pledges both President Sirisena and Mr Ranil Wickremesinghe lost their political relevance and I had emphasized the need for a third force in many of my articles.